After all sorts of feints, and a tightly controlled process concluding in a an Apprentice-style prime-time TV reveal, the president nominated D.C. Court of Appeals Judge Brett Kavanaugh to the Supreme Court vacancy created by the retirement of Justice Anthony Kennedy. Kavanaugh was the front-runner from the moment Kennedy (for whom he clerked) announced he would give his Republican Party a crucial spot on the Court. Yes, there was some right-wing flak confronting Kavanaugh’s name during the brief period of speculation over Trump’s choice. But it was mostly from advocates of other candidates (especially the provocative right-wing alternative Amy Coney Barrett), and focused on Kavanaugh decisions that merely showed he was cautious about direct challenges to abortion rights and the Affordable Care Act. No one who criticized Kavanaugh from the right is likely to challenge his confirmation. All along he was the consensus favorite of the conservative legal community, including Leonard Leo, the Federalist Society executive director who has led the judicial vetting process for Trump. His long judicial and political record (before becoming a judge he was a longtime assistant to Special Prosecutor Ken Starr and then a legal adviser to President George W. Bush) provided ample cherry-picking opportunities for advocates of his rivals, but no smoking guns. He is as safe a choice as Trump could have made, which reflects his understanding that this pick — far more than Neil Gorsuch’s nomination to succeed conservative icon Antonin Scalia after Mitch McConnell kept that seat warm for a Republican president — is the real deal-sealer for his relationship with the movement conservatives and conservative evangelicals. 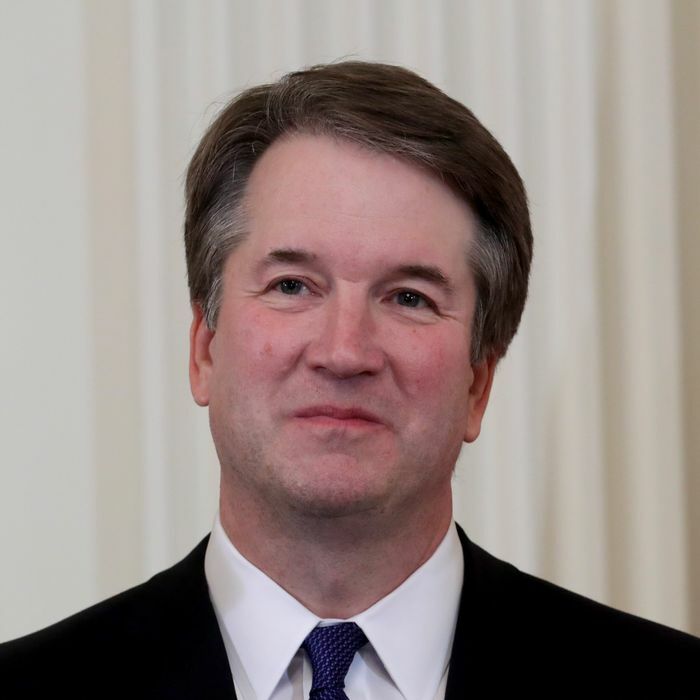 Assuming Kavanaugh is confirmed, and however he proceeds in promoting the multigenerational conservative project of reversing Roe v. Wade and eliminating any federal constitutional right to an abortion, the vetting process that placed him at Trump’s disposal almost completely eliminates the possibility that he will join Kennedy and other GOP Supreme Court nominees in betraying the right-to-life movement that has so loyally supported the Republican Party over the years. But like Neil Gorsuch, he is precisely the kind of careful jurist whose lack of any direct paper trail on cases involving abortion rights will make it easier for pro-choice Republican senators Susan Collins and Lisa Murkowski to maintain the fiction that the future of Roe v. Wade is uncertain if not secure. In his own remarks after Trump introduced him as his SCOTUS pick, Kavanaugh seemed to emphasize his Catholicism, perhaps as a shout-out to disappointed supporters of Amy Coney Barrett, whose own conspicuous Catholicism had baited Democratic senators into questioning conflicts between her faith and her constitutional scruples when she was appointed to the Court of Appeals. For what it’s worth, Kavanaugh, if confirmed, will solidify a Catholic SCOTUS majority representing either five or six justices, depending on how you classify sorta-Catholic and sorta-Episcopalian Neil Gorsuch. All in all, Trump has chosen a judge who equally appeals to his Establishment Republican supporters and his “base” of cultural conservatives anxious to turn back the clock on constitutional rights established over the last half-century. His political background in the Starr constellation and the Bush White House make Kavanaugh almost ideally suited to the rigors of the confirmation process. You never know what will happen down the road. But in this, the area of the Trump presidency where he has shown the most self-discipline, he has again kept his promises. Ironically, he has launched what could turn out to be the most emotional SCOTUS confirmation process since the Clarence Thomas/Anita Hill saga by making the kind of choice Kavanaugh’s (and his wife’s) old boss, the “low energy” George W. Bush, would heartily approve of.